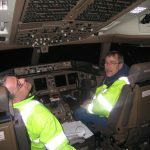 Part Eleven of the V Australia Boeing 777 Delivery Flight blog has us finally flying our first aircraft. After a late(ish) finish last night, I joined the cabin crew at 06:15am to be out at the aircraft in the early twilight hours. While the flight crew pickup was scheduled for 8:00am I couldn’t resist joining the cabin crew who were going to the plane early to complete their aircraft familiarisation training before today’s pre-departure festivities. While getting out of bed at 5am this morning (midnight body clock time? – I don’t know anymore …) was hard work – from the time the lift doors opened and the first cabin crew member joined me in the foyer, the excitement has just kept on building. The crew are just so motivated and thrilled to be here – and so am I! Of course nothing goes to plan, and on a delivery flight, I was always expecting the unexpected – so when I received a call from a Boeing engineer to the effect that when they powered the aircraft up this morning, the upper display unit (DU, one of the Electronic Flight Instruments Displays that provides the engine instrumentation) was un-serviceable – I took it in stride. While I was fairly certain, I broke out my laptop and checked the Maintenance Procedures DDG (don’t tell anyone I referred to a “non-controlled document”) – as long as we swapped Upper for Lower, we could go. If you’re like me, you’re thinking – “We’re parked at Boeing! 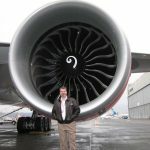 – they MUST have spares!” And you’d be right – except that the aircraft is technically “delivered” now and Boeing don’t deal in direct spares to the aircraft. Paperwork, Paperwork, Paperwork. With no one present except the Boeing crew preparing for the event we headed straight to the plane, and there she was as beautiful as we’d been led to expect. Of course, I could be biased – it’s been 8 months since I’ve stepped into a real plane. Simulators are excellent for retaining currency, but there’s nothing like the real thing. We arrived at Boeing and walked through the “Party” area where the delivery ceremony is to be – it’s all set out as a beach set, with coloured balls, surfboards and the Boeing crew in windbreakers (did I get that right?) with “Life Guard” emblazoned across them. Lots of tropical drinks and tropical nibbles. While I discussed the DU with the engineer, Nikki Thorn our manager of Cabin Crew hopped in first, then set herself up to take a picture of all the crew placing their foot over the door sill – all at once. All the operating cabin crew boarded the aircraft at the same time (Nikki has the picture) how fabulous is that? I ran around discussing the likelihood of a replacement DU with Boeing, and eventually woke up poor Phil Warth in Brisbane (say, 1 am Australian EST?) to put him on the case. It took over 3 hours (which is a measure of the degree of paperwork ‘flexibility’ required) but a replacement DU arrived and was fitted. I toured the aircraft with the crew and looked for differences from what I’m used to. 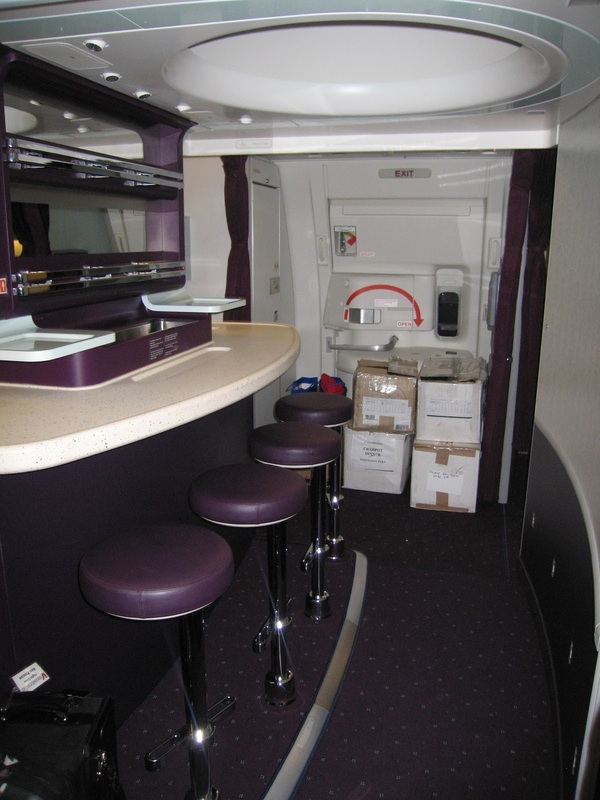 The cabin is excellent, with shades of purple (Meg’s favourite colour) all through the premium cabin (do you think that’s a sign that I’ll be able to buy her staff tickets there?). I also inspected the Bulk and Main cargo holds for security. Flight Crew rest DOES have IFE (sadly not the cabin crew rest though) and the rest area seems to be all it was reported to be. Interestingly the bunks have a slight tail up tilt, which I’ve not encountered so markedly before. 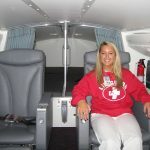 EACH bed has TWO oxygen masks. Hmmm. 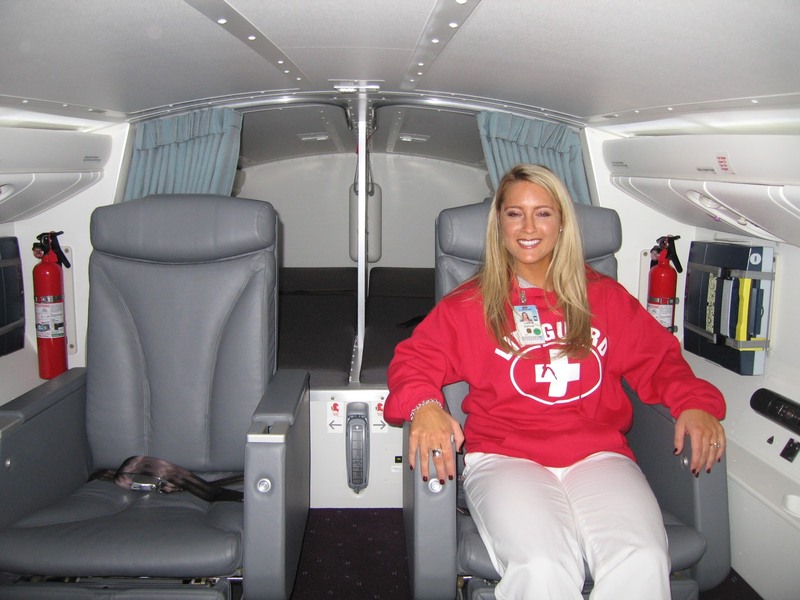 Lisa from Boeing volunteered to model the crew rest area for me. All the Boeing staff have been fantastic – they’ve bent over backwards to help me personally on both operational and personal requests. Their involvement has been a true highlight of the trip for me. The bar is very cool with its own pop down oxygen supply for decompression, although it caused some consternation when Natalie noticed that each of the PSU’s had little “INOP” stickers on them. 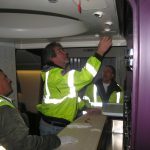 I discussed it for a while with the Boeing guys, who decided they were put on at Boeing when there was no bar, the bar was put in at Victorville, and the stickers were left in place. I asked them to open the PSU’s and check there were present and serviceable, then to remove the stickers. That’s when the fun started – the Boeing guys must have spent 20 minutes trying to open either PSU. Normally there’s a little tiny hole and while there’s a tool to do it, pretty much any old stick will pop them down. Instead, these PSU’s had a little slot, and the Boeing guys had odd little strong plastic strips that fit in the slot and would hook on the catch inside and pop them out. Well, that was the plan … but 20 minutes later they didn’t have it open. I missed this bit, but they then “got creative” and managed to get them open without damage – PSU’s present and serviceable. They closed them up, removed the stickers – and there were the holes you can stick anything into to open the PSU! The crew meanwhile had headed back into the Hanger for some PR. A couple of VERY understanding cabin crew were given a … ahem … special uniform for the event. I’ve since reached the conclusion that while our current cabin crew uniforms may be stylish and functional – they do not do our crew justice! Only at V … Only for V! It was round about this time I struck Don Moloney (V Engineering) who has been faithfully following the aircraft around the States, nursing it through various ills with Mick. He was morosely working through maintenance documentation and staring at an EICAS status message which was a no go item. 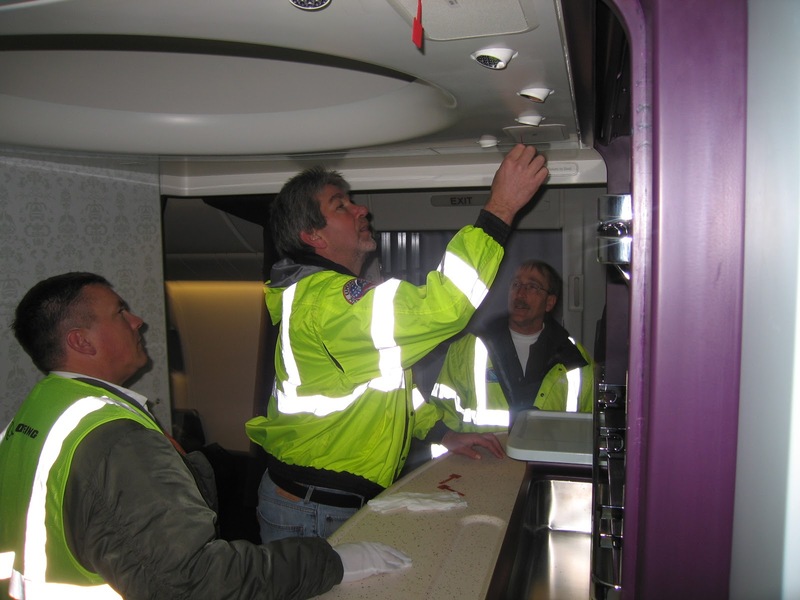 It was electrical, so after much part checking/swapping/changing, we eventually powered down the aircraft completely for 20 minutes, then powered it up in the hope that the problem would go away (believe it or not – a valid, documented maintenance procedure apparently – I believe they got it from Bill Gates). Well, the message was still there. Things were looking bad, we were an hour before departure and Brett Godfrey was being held in limbo between the speech that would launch us all onto the plane, and the speech that would take us back to a hotel. It was then noticed that “ELMS P210 PANEL” had, in fact, become “ELMS P210 CHANNEL” which had no dispatch limitation. Suddenly it was all on for young and old – they rolled back the hangar doors (we were parked just outside) to reveal the plane that would be taking them all to LAX. Nothing like last minute drama to add to the adrenaline of the event. Passenger boarding seemed to involve an inordinate number of visits to the flight deck, which we took with good humour. At this point, nothing could dampen our spirits, although we knew we were on a tightening schedule. Dave Kienzle flew the aircraft to LAX, with Clive from CASA on the jump seat. Andy Grierson and Craig “Marto” Martin assisted us greatly and ran interference for us with the cabin as well. 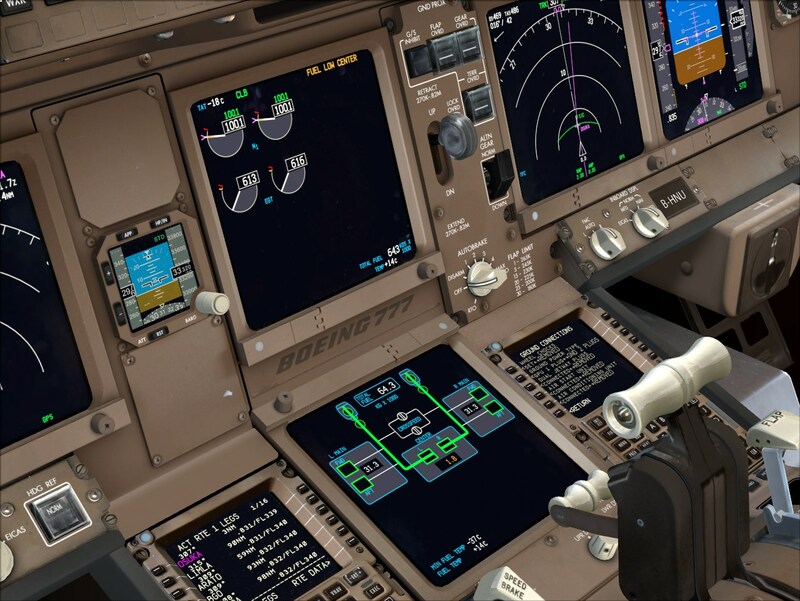 Brisbane backed us up with Maintenance, Flight Documents and Loadsheet support. Boeing were there for all sorts of things. 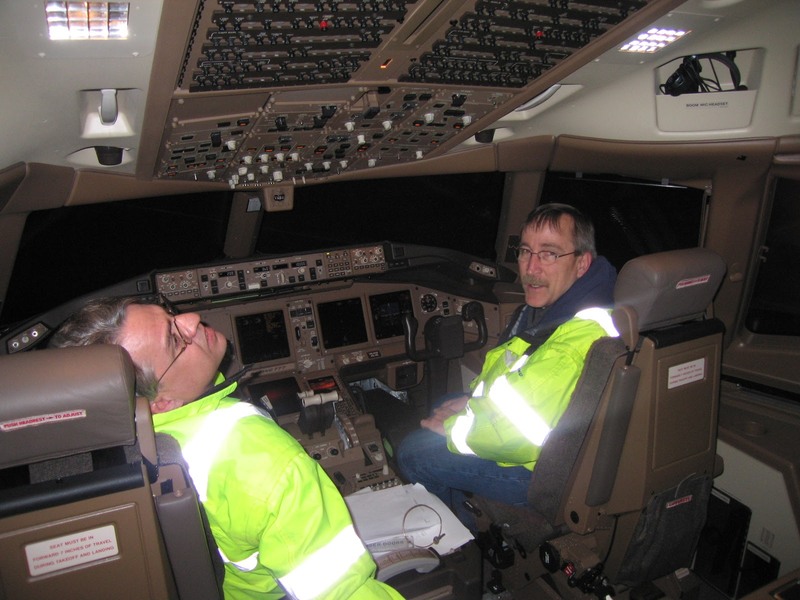 It really was a team effort – no more of this two pilot stuff for me. There were a number of operational issues to discuss – wet runway, long taxi, jet blast an issue because of the hanger/the crowd and because we had to start taxi with a tight turn, mountainous terrain – it was all there. But start, taxi and takeoff – and indeed the flight – were routine – and thoroughly enjoyable – from that point on. So good to be back in the real job again. The aircraft flew well – you’re all going to love flying her. Descent and Approach were also pretty standard into LAX – other than icing in the cloud and bouts of moderate rain all around LAX. It actually started raining over the field about 30 minutes after we parked, and didn’t stop for quite some time. Despite some rocky turbulence very low to the ground, and an autocallout that forgot about forty feet, Dave pulled off a greaser in a gusty crosswind. We landed on RW25L and cleared on A7 – right at the display area (who’s wooster was that?) and waited for a tug to tow us in. Flight Deck windows down and Australian Flags were out. It looked like a thousand people were there to greet us, along with a marching band and cheer leaders (this is LA after all). Sir Richard went for his much reported wing walk ala champagne frizz – although Marto had to first roll out the rubber matt because no one else would go out there and do it! Brett Godfrey popped his head in just after shut down, thanked and congratulated us and gave Dave a very nice keyring from Boeing. Someone later asked about the key ring and I told them that the reason we were slightly delayed from Boeing Field was because no one could find the key to the aircraft. Apparently they believed me and that story has rolled up in a few places since. In hindsight, probably not a good idea to joke about that! Then all our passengers wandered up and down the plane for 20 minutes, then all got off for an hour, then a couple hundred got back on at L1, mostly industry related people, who wandered up and down the aircraft admiringly. 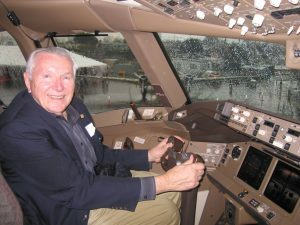 I sat in the FO’s seat and took pictures of anyone wanting their picture taken in the Captain’s seat of a 777. I must have snapped off at least a hundred photos for people, and chatted with prospective passengers about all sorts of aviation (and non-aviation) related things, not to mention taking pictures for the 20 or so who didn’t have their camera – hence the odd people in my online picasa album, sitting in a 777 flight deck. Paul Halpin and Kev Beard were waiting at LAX and eventually fought their way the wrong way through the crowd to the plane. We all caught up during the lull between loads and munched a few crew sandwiches. By now it was almost seven o’clock and the public had mostly moved on with their lives. We wearily gathered our things and got out of the plane, stopping only to take the obligatory crew Engine pictures before continuing on. 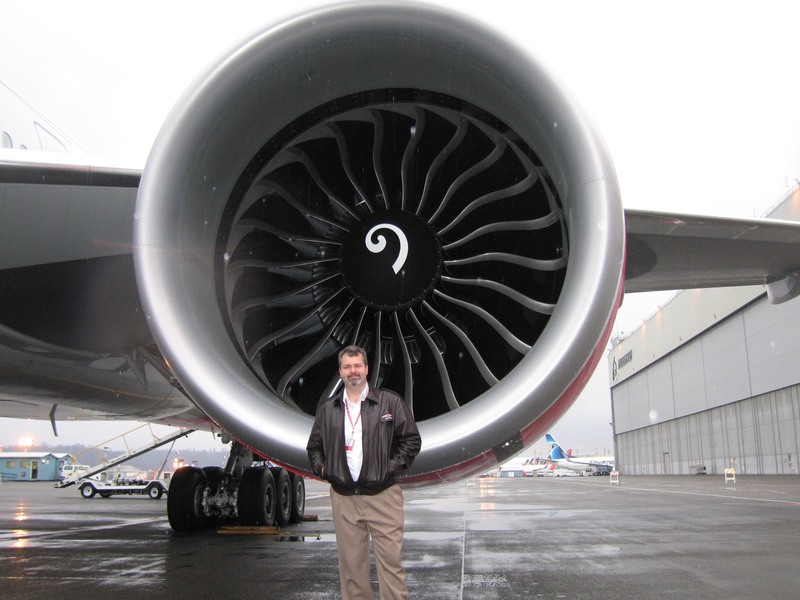 I have yet to have my picture taken in the nacelle of a 777 GE engine, but it will happen one day soon I hope. Tomorrow is the Universal Studios tour. For me however, after the whirlwind of the last four days, I’m looking forward to a quiet day in the Hotel and trying to catch up on some of the work that has been piling up. The CASA EDTO review was cancelled this evening (thanks to all who helped “manage” that) and it will take place on the LAX-SYD flight instead, so tomorrow will also involve some study. Tomorrow evening will bring dinner a Bubba Gump Shrimp for the non-crew travelers, while the rest of us head out to get the aircraft ready to go. Today felt like the culmination of an awful lot of work and for me – a grand moment in my personal career. On a personal note, I’d like to thank Phil Warth and others in BNE who probably got no sleep at all last night because of the shenanigans on the aircraft this morning. Tomorrow night’s flight, which will include a flyby of the harbor bridge on the way into Sydney (weather permitting) will be the icing on the cake.